In the past few weeks I've been experimenting making "Pooh bread" using my friend's recipe. It's amazingly easy and I think I have it almost and just about right. However, we have had some flops ("not too hot, not too cold but JUST RIGHT") for which the ducks by our local pond have been incredibly enthusiastic about. One man's trash is another duck's treasure, as they say! This has also produced some fun family outings as we have gone out together to rid ourselves of these Lumps of Lead. While I have been failing in the bread department to some extent, I have been succeeding in attempt to return books to the library ontime! We even went back for some more! Given our duck philanthropy, I decided to get some books on ducks for us to read. 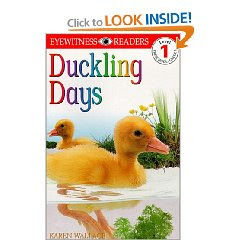 The best book from our stack was DK Readers: Duckling Days . I spent the whole time wondering exactly how they managed to accomplish getting the photographs for this book. Duckling Days is laid out in a story format, which follows one particular duck family - from pre-birth to the time when the ducklings are learning to swim in the water with their mother. 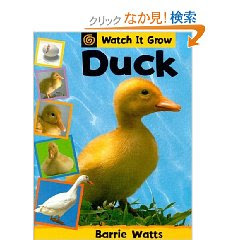 We gleaned from this book that ducks lay eggs from which more baby ducks come. (I'm waiting for him to connect dots to my cracking eggs for recipes. So far we're good.) This book isn't really scientific but it does cover basic facts and includes interesting photographs, making this a quick and easy read. Bottom line: We can bake bread, feed ducks and are adult enough to get the library books back on time. I CAN improve. Just watch me! Yep, I keep telling myself this fall I start High School for the third time. There must be something in High School that I'm not getting; the Lord keeps putting me back through it. 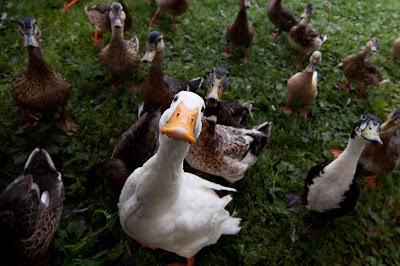 So great photos, the ducks are cool! Oh my goodness!! Those pictures are so cute!! LOVE that second picture with duck poking its head at you. 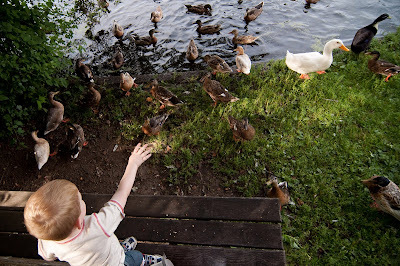 We are banned here from feeding the ducks and geese, as they gather on the lawns. It was fun when we could. Such a sweet set of pics!